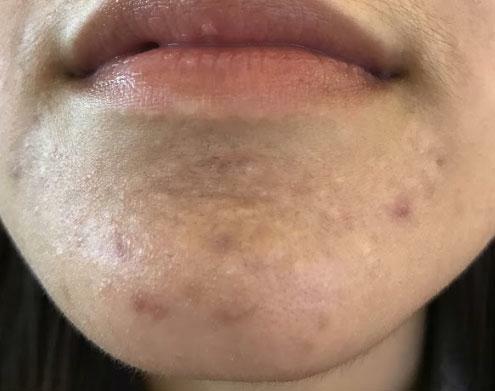 Acne breakouts are not only difficult to deal with while the acne is active, but it is even something patients must address after the acne clears and the skin is left scarred. Active acne blemishes are inflamed and damaging to the skin and tissue around and beneath the blemish. As the acne begins to heal, the body’s natural healing process includes a production of collagen, a vital material created by our skin to support its integrity. Inflamed, swollen, red, and painful acne, usually cystic and nodules are much deeper-rooted in the skin and thus have a greater chance of leaving a scar during healing. Untreated acne that lasts a long time. The longer there is acne inflammation, the greater chances of their healing causing scars. Picking at the skin, “squeezing” or “popping” acne blemishes increase the inflammation of the skin which in turn increases the risk of scarring. Genetics. Scarring and scarring tendencies run in the family. There is no straightforward way of knowing if an acne patient will develop scarring or not, as each person’s skin is different. However, there is a way to reduce the possibility of acne scarring during active acne by treating the acne and the healing process together. Theraclear Acne Treatment: The TheraClear™ Acne System successfully treats both inflammatory and cystic acne – without medication, ointment or cream. Schedule a consultation to see if Theraclear is right for you. Q1064: Thermage procedures can help smooth, tighten and contour your skin for an overall younger looking appearance in a single treatment without surgery or injections. CO2 Ablative Laser: CO2 laser resurfacing is done to treat sun damage, age spots, and any other hyperpigmentation on the skin.